The Spanish National Biotechnology Centre (Centro Nacional de Biotecnología, CNB) offers three 4-year working contracts, funded by Obra Social ‘la Caixa’, to provide highly talented PhD students with a unique opportunity to start a scientific career at one of the Spanish ‘Severo Ochoa’ Centres of Excellence. Working contracts will begin between September and October 2015 and include an annual gross salary that increases progressively from €18,546 in the first year to €22,558 in the fourth year, with an annual allowance for thesis-related expenses (€1,500 in the first and second years, €1,700 in the third and fourth years), and full social insurance coverage. The International PhD Fellowship Programme ‘la Caixa - Severo Ochoa’ is committed to scientific excellence. Successful applicants for one of the three contracts available are expected to have outstanding academic qualifications and a strong motivation to join one of our currently active research lines in biomedical or agricultural sciences. NOTE: The following points are meant to provide a brief and orientative overview of the main eligibility criteria. Please refer to the forthcoming call or contact us for detailed information (see below). NATIONALITY. This call is open to applicants of all nationalities. Students with nationalities outside the European Union need to accredit legal immigration in Spain before the application deadline. If selected, non-Spanish residents must have a valid work permit before signing a work contract with the CNB. AGE. No specific age restrictions apply for this call. ACADEMIC DEGREE. Students must hold a university degree that qualifies them to initiate a PhD thesis in Spain. Specifically, they must accredit that they have applied for admission or have already been admitted to a PhD programme in a Spanish university before the application deadline; before signing a work contract with the CNB, selected candidates must have successfully completed the admission process. If they hold academic degrees obtained from a university outside of Spain, PhD students must have homologated these academic degrees or accredit that they have already initiated their homologation in Spain before signing a work contract with the CNB. PREVIOUS PhD FELLOWSHIPS. Applicants must not have been beneficiaries of a previous PhD fellowship funded by the ‘la Caixa’ Foundation nor have been contracted as a PhD student for more than four years (six years in the case of disabled students) by any other institution; in the case of PhD students who previously obtained a Spanish fellowship according to Royal Decree 63/2006-January 27, a 12-month limit applies. 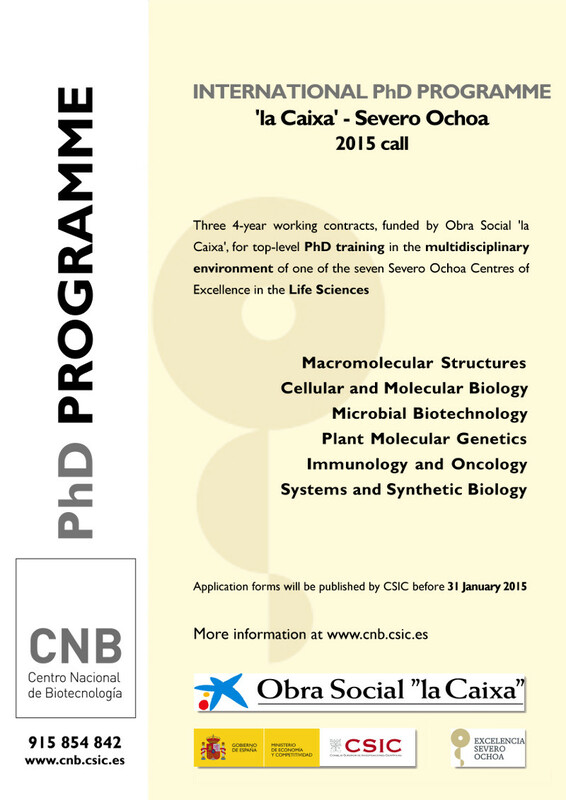 Applications must be submitted to the CNB umbrella organisation, the Spanish National Research Council (Agencia Estatal Consejo Superior de Investigaciones Científicas, CSIC), according to the instructions in the call for applications that will be published before January 31, 2015; the call will be open for 20 days. An independent selection committee will evaluate the academic and scientific merits of eligible candidates. Top-ranked candidates will continue the selection process by passing an interview with the selection committee. The selection process will be terminated before the end of July 2015, and successful candidates will be contracted between September and October 2015. Please consult our web page on a regular basis for updated information on the call and selection process. How we can assist you in your fellowship application?